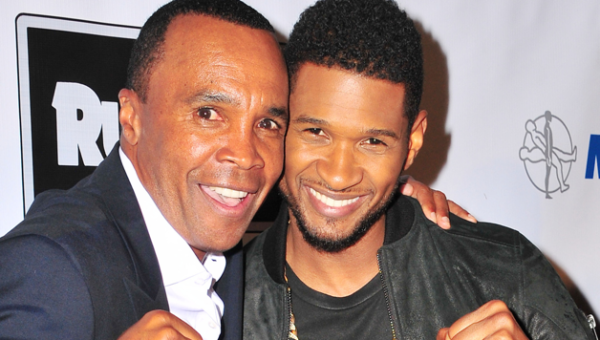 *Ask Sugar Ray Leonard who would be the best actor to play him in a movie and he would probably mention Usher. The boxing legend had nothing but praises for the singer, who is portraying him in the upcoming movie “Hands of Stone.” From the looks of it, Usher appears to be a natural fit for the role. “He has that thing, that thing that has no name — and that’s that feel, that’s our rhythm, Usher has that,” Leonard told HipHollywood.com. “Hands of Stone” tells the story of Panamanian boxer Roberto Duran, who fought two legendary boxing matches in the 1980’s against Leonard. According to reports, Usher had to drop from 180 pounds to Leonard’s fighting weight of 146 pounds, grow an afro, and go through an intense boxing workout regimen in order to play Leonard. That’s fine, dandy & all?, but umm…..why are these mofos ….”dancing cheek to cheek”!?? Some normal ppl aren’t afraid to show affection to each other and are comfortable with their OWN sexuality..heterosexual or whatever..I find nothing wrong with the photo nor would I even entertaint the ideal of anything LESS than dudes in a photo(smh)..why would I do that? Why would anyone do that? UNLESS? BTW both are making a boxer’s fisk as well..
Umm….I understand, see, you’re?, ….uninformed & “sennnnnnsitiiiiiiiiiiive”. 1st?, it was a fkn joke, ok? 2nd…..real talk?, NO straight man gets “that” fkn close to another! We don’t even “sit “right next” to another man, in a theater”, that shyt is ALWAYS…”spaced out”. And…”that’s not being a homophobe, “that’s” being…..”SRTAIght”! And…no dis to anyone’s “lifestyle”?, but since what I just stated IS “truth”?, then it’s their “physical closeness” that calls into question their…realationship. Further?….you really come off lika damn “caped crusader” trying to protect your homie”, from something YOU say…doesn’t stick! But again, it was a obviously a…….jooooooooke. Where’s your sense of “ha ha”!?? See?, “YOU” c/z more speculation than the joke, with this sense/need of an…. urgent “swoop”. And/but lastly?, you should research a statement Ursh made about 8-9 years ago, regarding his “lifestyle”/potentially being gay, do to a former assistants forthcoming book, at the time!, & to paraphrase?, he said…”my talent should be the only important thing, & my personal life is/should be…my business”! Now..”that’s” some straight out 1997 vague “Ricky Martin” shyt, right thurr!! !, for I ALSO don’t know ANY straight dude, who would leave that shyt “dangling/UNanswered” like a …”letter from yo fkd up “ex”. So….maaaaaaybe you should be speaking for only “one” side of this ….”dancing duo”. Kapeesh!?? I love bro. Leonard for being a role middle.